With the unique Florida terrain, Coore and Crenshaw delivered a masterpiece. The Red course and the Blue course share a clubhouse, and the Red Course loops around the Blue course, which meanders on the inside of the land. I found the defining characteristics of the Red course to be its massive scale and variety. Having never played in the British Isles, I had never seen sand dunes of this magnitude, and Coore and Crenshaw did a marvelous job of uniquely routing the holes to showcase the unusual topography. The Red course also possesses tremendous variety. It has challenging long par 4’s, vexing short par 4’s, par 3’s that investigate all aspects of your iron play and option-filled par 5’s. Coore & Crenshaw’s ability to effortlessly blend playability while still challenging and stimulating the great player is something that I always admire, and the Red course fits right into that mold. It begs you to hit the heroic shot and when pulled off, you are rewarded with a relatively flat putt. But when you miss, a tough two putt, an up-and-down or worse awaits. They do this all while offering a less threatening path for the less-experienced player. 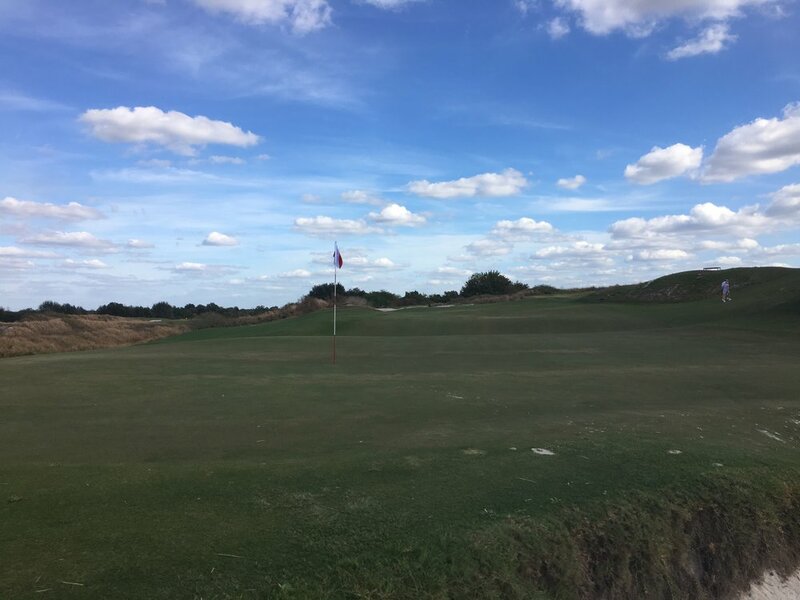 I played the Red course the day before Streamsong’s annual invitational and was treated to greens running north of 11 on the stimpmeter, a firm and fast course, and ideal playing conditions with temperatures in the high 70’s and a gentle breeze. Quite the day for a mid-morning stroll around a Coore & Crenshaw design. Coore & Crenshaw hit players with an early ball buster on the 474-yard first hole, which runs up a gentle hill. The fairway is generously wide and the key is to avoid the right fairway bunker. From there, a player is left with a long iron approach to the elevated green that’s guarded by bunkers on the right and short left. This hole is made particularly tricky by the elevated and back-to-front sloping green. For a strong player, the tendency will be for the shot to miss long because of a lack of spin into the elevated green, which then leaves a tricky downhill putt. Meanwhile, the average player’s miss is often short on longer holes, which leaves a relatively easy uphill pitch, pure genius. 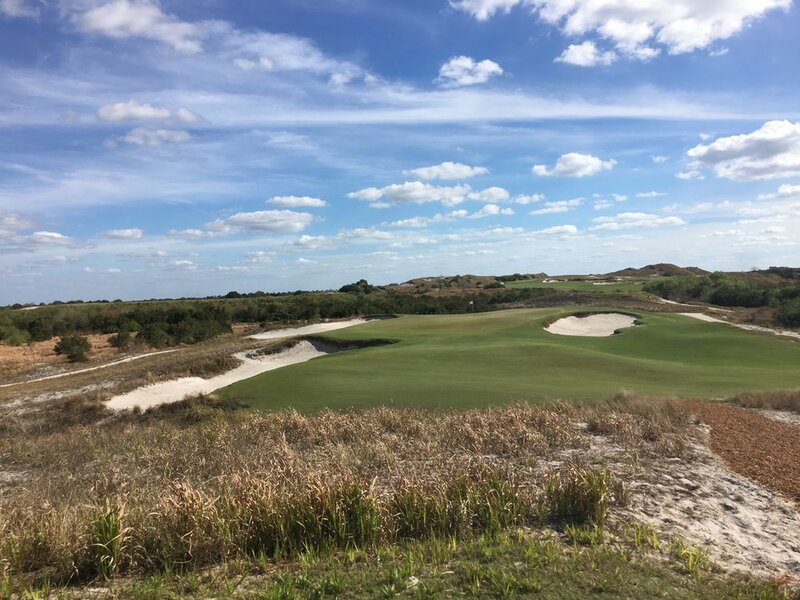 After the tough opener, Streamsong Red gives players a chance to get one back at the par 5 second. The hole doglegs slightly to the right with a water hazard running up the right side. Something I’ve noticed with Coore & Crenshaw designs is that they like to obstruct the ideal driving line with a nearby hazard or bunker, creating a little risk and reward to each tee shot. The second hole is a perfect example as a drive up the right side yields a much shorter shot for those attempting to reach the par 5 in two, but that line is guarded by the water hazard. I am a wimp, so I bailed left, and while there is an abundant amount of fairway there, my second shot was much longer. A massive dune on the right side of the green is the dominant feature of the second hole’s approach. Those laying up need to navigate a small bunker in the middle of the fairway as well as a few on the right side. 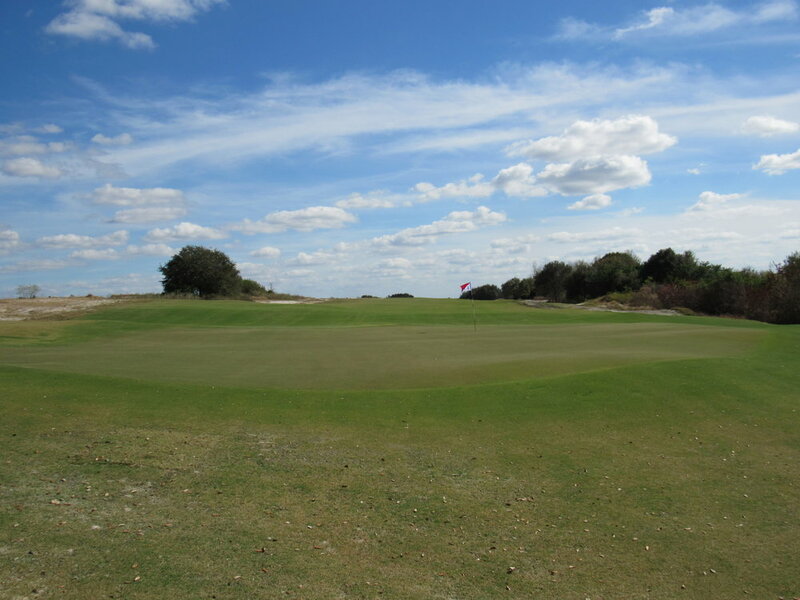 The green is pushed up on the dune, and the green runs off to the left where there is a massive collection area that players can putt, chip or pitch from to the multi-tiered green. 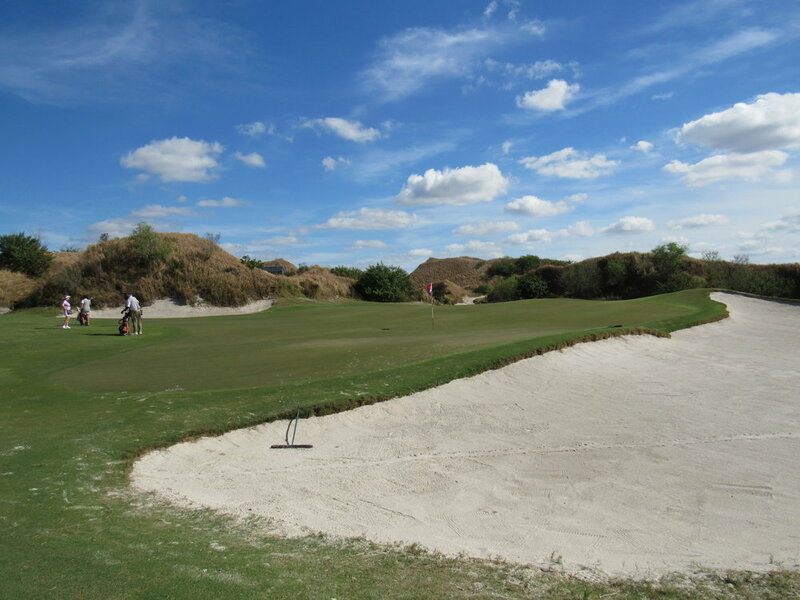 The walk from the 2nd to the 3rd sends a player up a big sand dune to the tee that rests atop it. From there, you’re able to get a good look at Gil Hanse’s new Black course, which will have its own clubhouse. Here are a few shots. From the elevated tee, the 3rd presents one of the most demanding tee shots on the Red Course. A good drive threads between the intimidating bunkers on the left and right side, with an ideal tee shot finding the right side of the fairway. A good drive leaves a short iron approach to a long, narrow and right-to-left sloping green. The green slopes significantly, so a good line is usually left of the flag. The 4th is the first of the Red Course’s short but challenging par 4’s on the front nine. The challenge at the 4th is the very shallow and wide green with considerable slope. Off the tee, the play is to hit driver and miss the distinct bunker that cuts up the middle of the fairway or lay back of the bunker to leave a full wedge approach shot. For those that lay back, the challenge will be controlling spin on the full wedge shot into the sloping green. 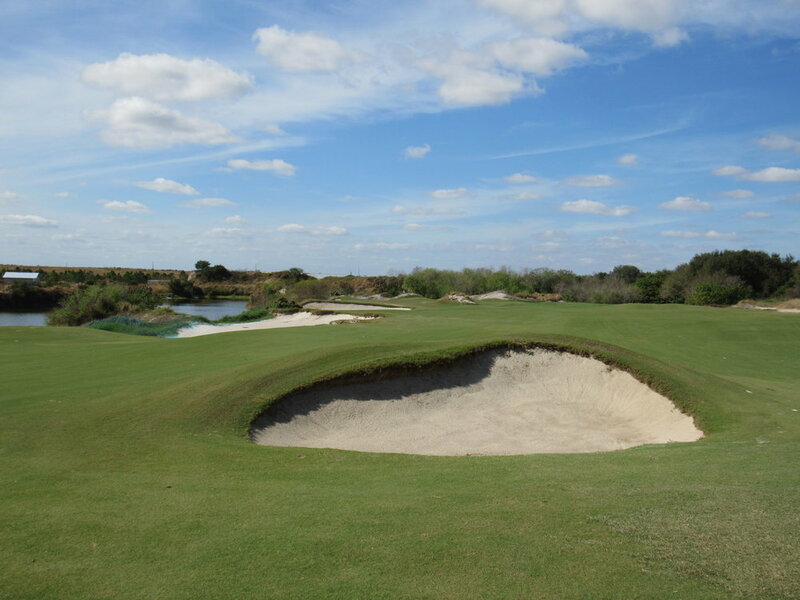 Likewise, the driver can also put players into a conundrum as it leaves a delicate pitch shot likely over the intimidating, deep and marvelous bunkers that guard the middle of the green. Coore & Crenshaw move from the vexing par-4 4th to the brute par-4 5th, one of my favorites on the course. 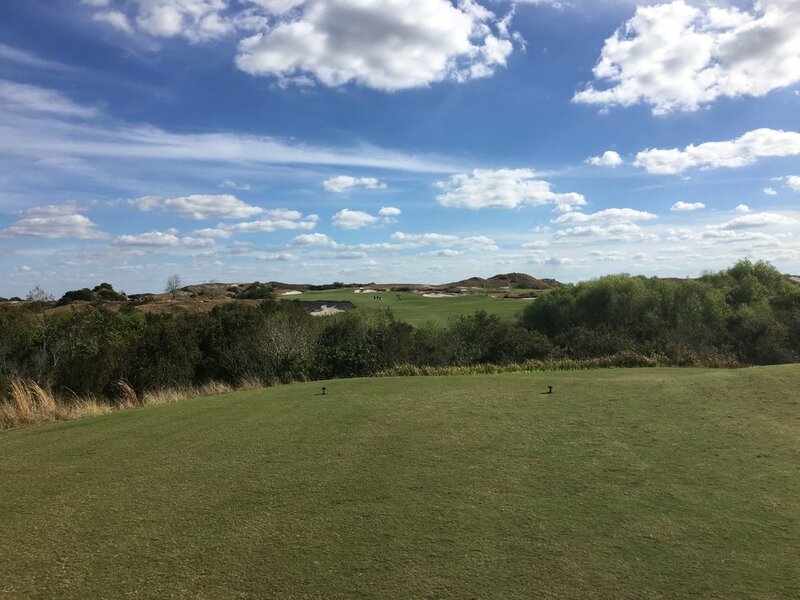 The long par 4 is framed by the memorable sand dune on the left side of the fairway, and the hole doglegs slightly to the right with a pond hugging the right edge of the fairway and running along the entire hole. A good line is up the right center, bringing the lake into play and setting up a mid-iron approach to the Double Plateau green that has a distinct collection area on the left and deep bunkers on the right and back side of the green. The 6th gives players their first par 3 on the Red course, a beautiful tee shot with massive features, a dune on the left, a bunker on the right and an extremely large green. The key to the 6th is finding the correct tier on the massive green. Up next is the par-5 7th that has water running along the entire left side of the hole. The drive is made difficult by the water as the ideal line is down the left side, which shortens the hole significantly. The hole has tremendous width for those who have to lay up, and where you lay up is heavily influenced by a distinct mound that obstructs part of the green. I love how Coore and Crenshaw used this distinct natural feature in the design. Another birdie opportunity awaits on the short par-3 8th that looks like a hole taken out of the Australian sandbelt because of its beautiful bunkering. The 8th has an extremely unique green that features a front finger that shortens the hole but requires an extremely accurate shot to find. A player must control their spin on the 8th as it’s easy to spin it off the green and even into a bunker. One of the greatest treats playing at either Streamsong course is the halfway house food. On the Red course, the food comes between the 8th and 9th and in the form of mouthwatering barbecue. I got the chopped brisket sandwich… and it was bomb. Following the barbecue stop, Coore & Crenshaw present another birdie hole with the drivable par-4 9th. The 9th can be deceiving with its massive bunkers that look close but actually require a decent strike to cover. I hit my drive left, which is not recommended. The green slopes hard from back-to-front and left-to-right, making any shot long or left, dead. After the birdie hole stretch of 7 through 9, Streamsong Red shows its teeth with a stretch of strong par 4’s at holes 10 through 12. The 486-yard 10th kicks the back nine off with a wide rolling fairway. A tee shot down the left side shortens the hole but obstructs the view of the green, while a shot down the right gives a better angle in but a longer shot. The green sits down in a small valley and has a lot of right-to-left slope on it. As with many holes on the Red course, the left side has a large collection area that makes for option-filled short game shots. I found the 11th to be an incredibly natural and beautiful hole. It seemed like Coore & Crenshaw just laid this hole on top of the natural land. 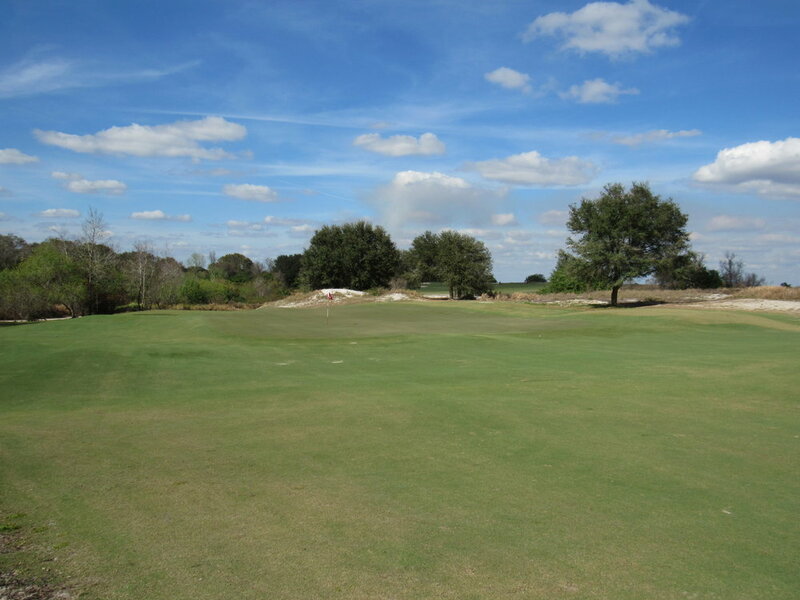 The wide fairway has significant right-to left-slope, and the tee shot is made interesting by the deep bunker that runs through the middle of the fairway. I chose to hit my shot down the left, and thinking back, I think the correct line is up the right because the higher ground gives a better line of sight and angle for the approach shot. What makes the 11th hole is the devilish green. It slopes front-to-back and is fronted by a deep bunker that is, speaking from experience, no fun. The close of the challenging stretch that opens up the back 9 is the long par-4 12th, which offers another extremely wide driving area. The dogleg left’s ideal line is down the left-center as a big ridge can act as a launchpad for your drive and significantly shorten the hole. Beware though, a shot short and left can be blocked out of the green. 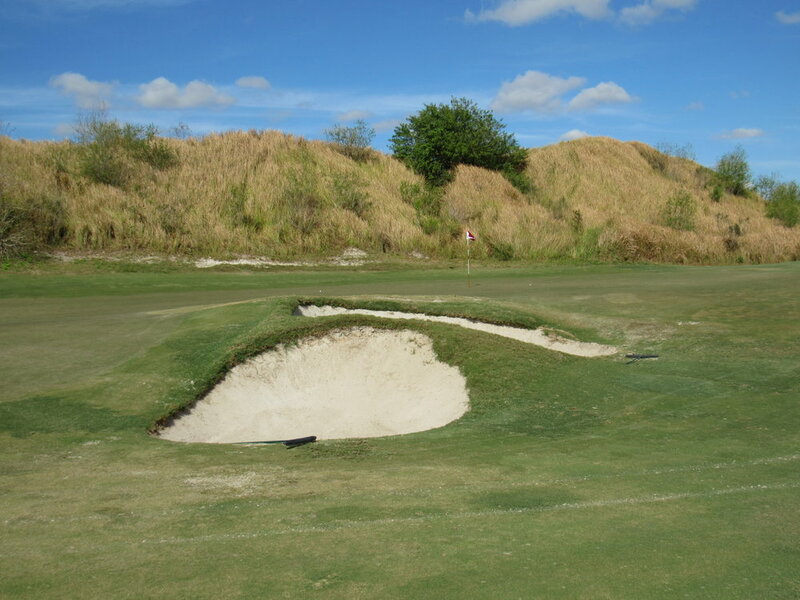 My favorite part of this hole is the green and its magnificent bunkering and collection area. The 12th is an absolutely fantastic hole from the tee through the green. 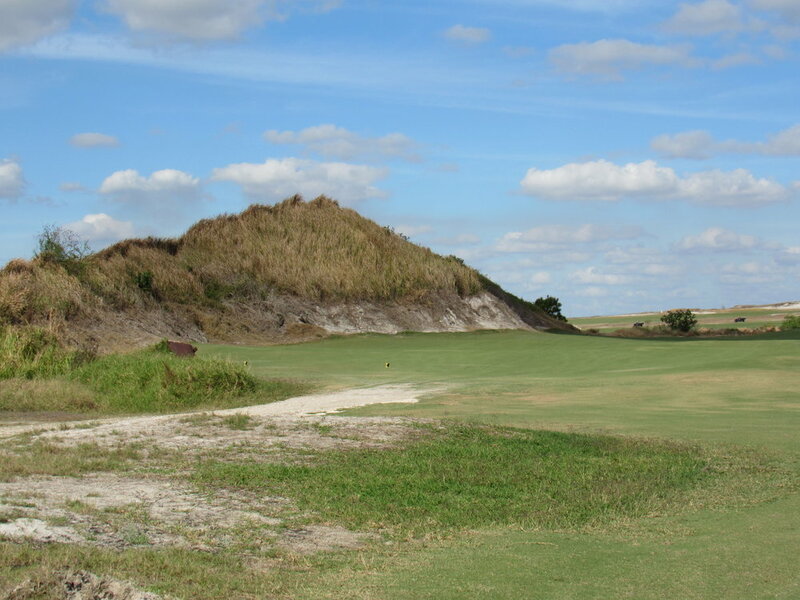 The first par 5 of the back nine again brings a giant natural sand dune into play, this time near the green. 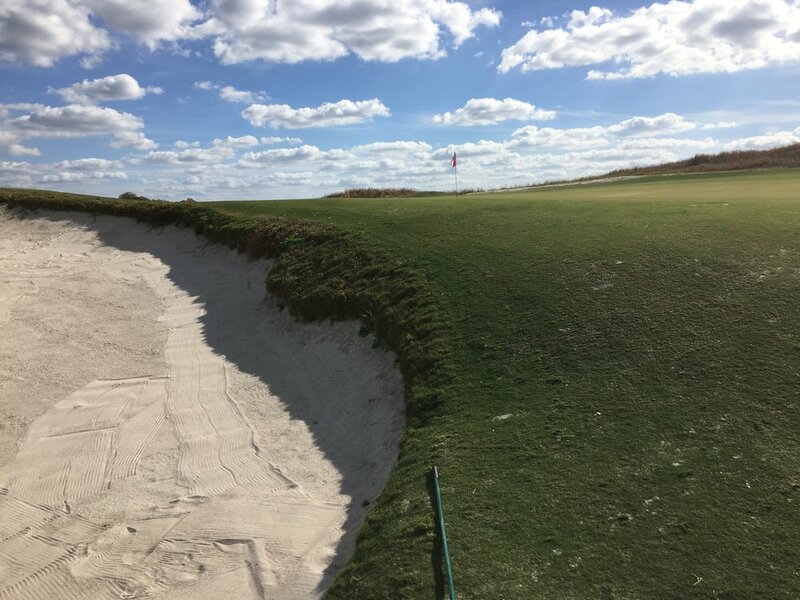 Because of the dune, which obstructs the view and certain angles to the green, the ideal teeing line for those hoping to reach the 13th in two is down the right side. This is a particularly tough task as the right side of the fairway funnels balls towards the centerline bunker. If successful, a long-iron and a clear shot awaits. 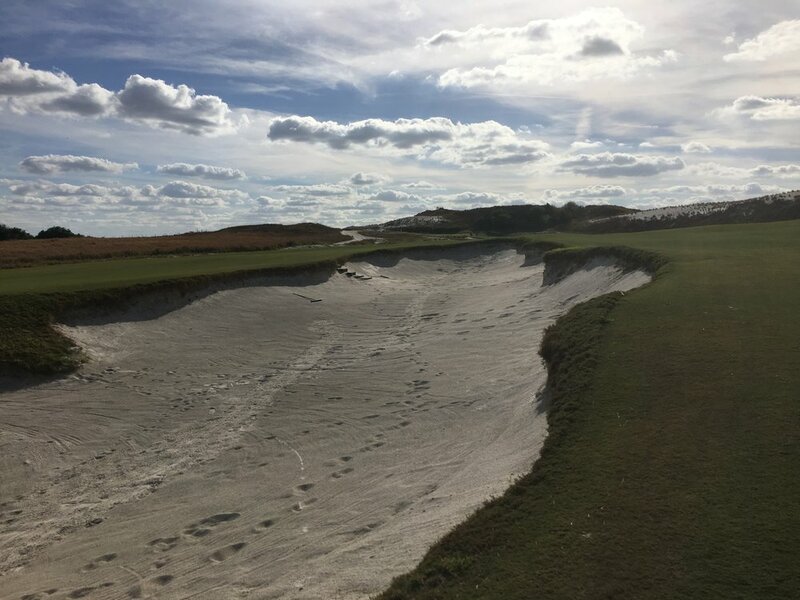 If not, the key to the lay-up is keeping the shot right and clear of the dune while avoiding the treacherous fairway bunkers on the right side. The back nine’s first par 3 is a beautiful one. It requires a precise mid-iron approach to the difficult turtleback green, which falls off on all sides. The massive bunkers frame this hole and really create character. The 15th signals the start of the Red course’s fantastic closing stretch. The long and tough par-4 15th is one of the best par 4’s I have ever played. 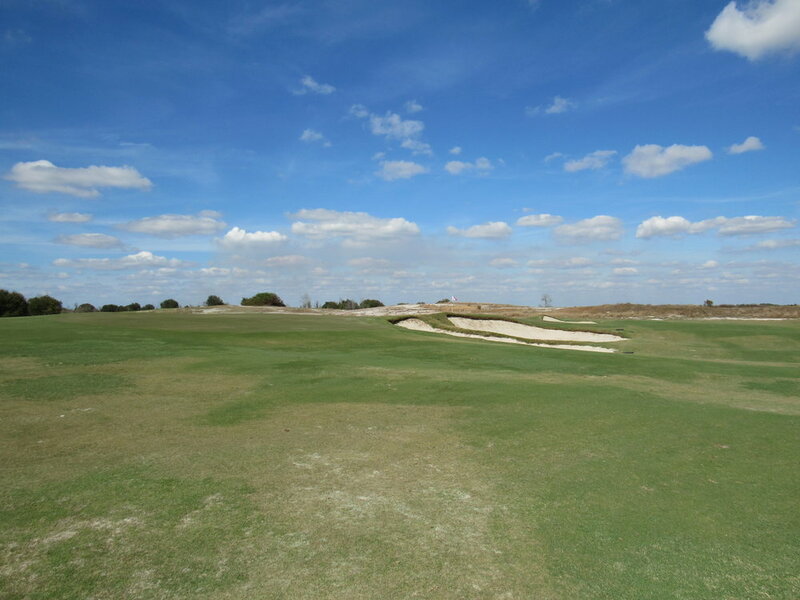 The hole’s tee shot is dominated by a massive bunker that runs up the left side. It’s one of the largest and deepest bunkers i have ever seen. As is typical with Coore & Crenshaw, the ideal line is down the left side, hugging the bunker as close as possible because of the great green complex that slopes hard from right to left. Because of the long uphill nature of the hole, any tee shot down the right side of the fairway will leave an extremely difficult long-iron approach to a green that slopes away. I had seen many pictures of the 16th before, but seeing it in person makes you realize that pictures don’t even do it justice. When the 16th came into sight, my jaw hit the ground. Coore & Crenshaw’s modern take on the Biarritz is unbelievable. 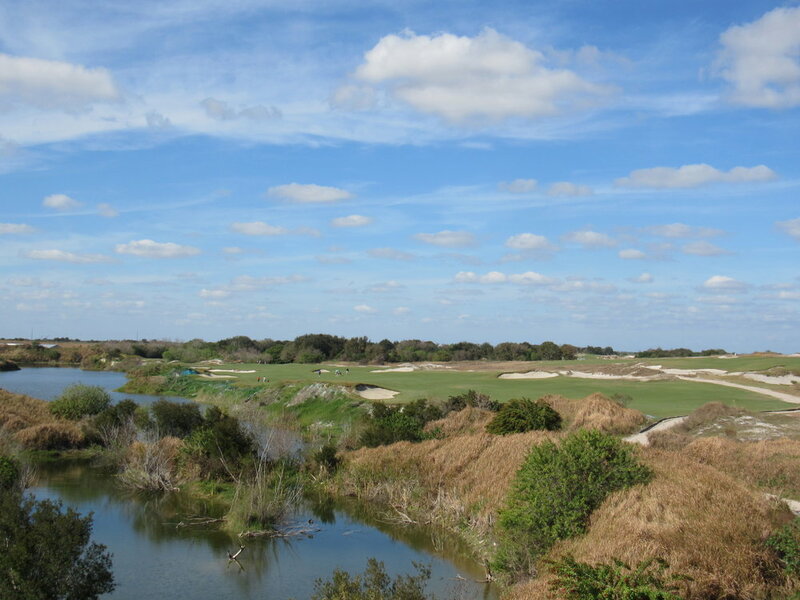 Playing over water, a la Yale, Streamsong’s rendition features a nearly 60-yard long green and a dramatic swale collection area to the left. I played the hole with a front pin and a slight tailwind, and the deep bunkering and lake made it a tough shot to get close. 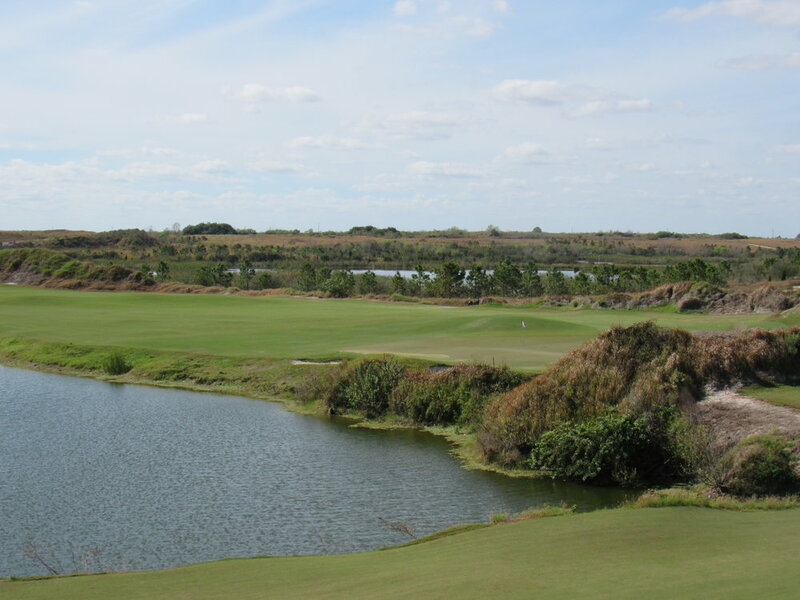 The 17th embodies Streamsong Red. Few would say it’s their favorite hole, but it blends well into its natural landscape, and it’s damn good. Fairway bunkers run down the right and cut in on the left, forcing a player to thread a tee shot in between them. The sloping fairway can produce big drives and leave a mere wedge into the green that rests beautifully on a natural ledge with run-off areas everywhere. Streamsong comes to a dramatic close with the stunning par-5 18th, which provides a great chance to get a shot back. The ideal line is down the left-hand side of the fairway to shorten the hole, but again that line is guarded by a large and deep fairway bunker. Upon arriving at the top of the hill in the fairway, players are treated to a majestic amphitheater-like setting with massive sand dunes surrounding the final green. A lay-up needs to favor the right side, while a player going for the green will have to aim for the left corner of the green because of the massive false front that runs along the right side to obstruct wedge shots. The 18th is a thrilling close, where an eagle or a double is feasible. Reflecting on the round, Streamsong Red has settled into elite company on my list of favorite courses. 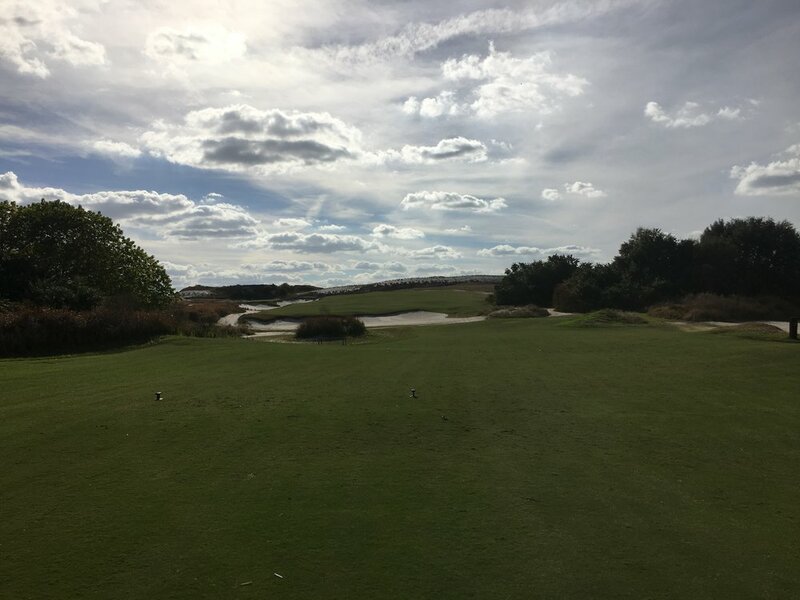 From the 1st through the 18th, Bill Coore and Ben Crenshaw had me excited to see what was around the next sand dune, while intellectually stimulating me with difficult strategic challenges and decisions throughout the course. It’s a course that accomplishes the rare feat of balancing playability for the average player while testing all facets of a great player’s game in unique and fair ways. When a round is nearing the end at my favorite golf courses, a bittersweet feeling rushes through my body, and this happened as I walked towards the 17th green. I was thrilled about the great golf course I was experiencing but sad knowing it was soon coming to an end. 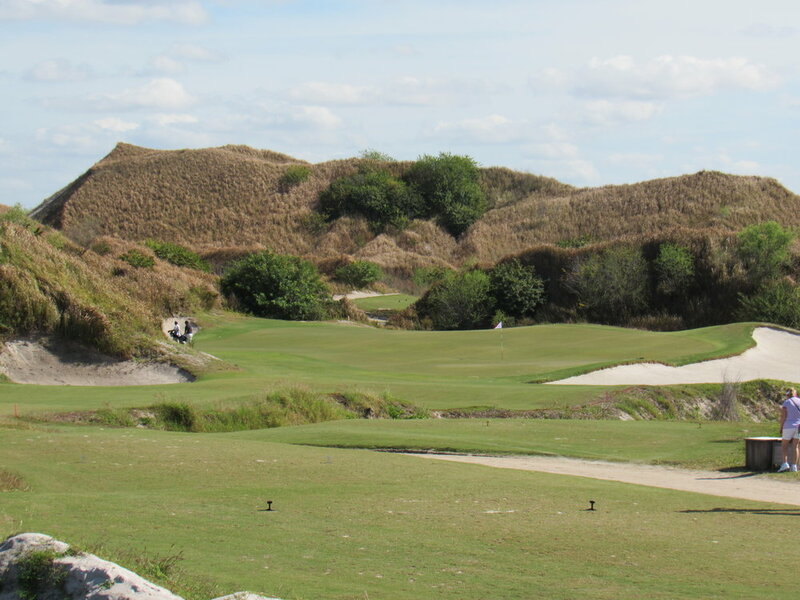 Streamsong Red is a course I would love to play every day and can’t wait to play again.